A lot of crazy and envelope-pushing things have happened at TBS’ Conan over the years, but Conan O’Brien isn’t the kind of late night host who often gets into extended car-chase sequences while eliminating dangerous enemies with the coolest secret agent that’s ever existed. But it happens in the video below, when O’Brien meets Sterling Archer. Enjoy, as if it’s possible not to. I can think of few pop culture avenues that cross paths as well as O’Brien in the Archer universe, but I admittedly never really considered what it would be like before. 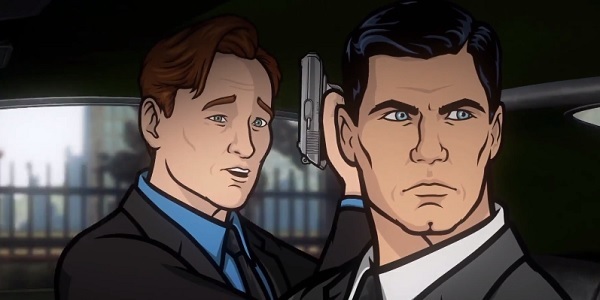 It’s Archer…with Conan O’Brien! Funny how things can be exactly what they are sometimes. While speeding away from Russian mobsters with neverending ammo supplies, the mismatched duo get shot at, talk about Tinder, do NOT talk about O’Brien’s wife, and full carloads of bad guys get demolished. O’Brien also gets to join in on the “Phrasing” game, although his first effort is as poor as his initial understanding for how a gun works. Plus, its stellar animation rivals the FX series’ sweetest action sequences. Sure, a lot of it is just them inside the car, but there are some nifty exterior shots. Who doesn’t want to just watch these two the whole time anyway? That Point Break remake should be about these guys. Done deal. Of course, the best moment is when O’Brien excitedly says he’s in the Danger Zone. It’s a weird thing to see an animated version of a real person quoting a fictional character’s catchphrases back at them. Now, is it too much to ask for this to be a running gag on Conan? Can FX and TBS cross-promote for a little while to allow it? I really, really want to see O’Brien spending some time in Dr. Krieger’s lab in a future episode. Or having a drink with Pam. Or all of the rest of the examples. Conan O’Brien paid some of his comedic dues in the animated world, having both written for and cameoed on The Simpsons, but I dare say his two-dimensional adventure here eclipses his vocal appearances on Matt Groening’s creation. And possibly anything else he’s done, which makes me wonder why O’Brien doesn’t have his own voice acting empire to accompany his series. Watch Conan every weeknight on TBS. Maybe soon we’ll get to see him go on a surreal double date with Jay Baruchel from Man Seeking Woman.